Upper cervical instability in my opinion goes mis or under-diagnosed in many patients. In order to diagnose upper cervical instability you must take a detailed exam and history and appropriate imaging. One of the best ways in my opinion is using a digital motion X-ray to evaluate the movement of the upper cervical spine and to measure the movement with digitization technology. I have found that sub occipital pain can be one sign of upper cervical instability. This is a diagnosis your patient can not afford to have you miss. This can lead to significant pain and disability and we need to know so we can give our patient the best care and treatment options. Plus, having a diagnosis you can objectify, just makes it harder for the insurance company to argue. I will list a reference below for you to have on upper cervical instability. J Am Acad Orthop Surg. 2014 Nov;22(11):718-729. Bransford RJ, Alton TB, Patel AR, Bellabarba C.
Injuries to the upper cervical spine are potentially lethal; thus, full characterization of the injuries requires an accurate history and physical examination, and management requires an in-depth understanding of the radiographic projection of the craniocervical complex. Occipital condyle fractures may represent major ligament avulsions and may be highly unstable, requiring surgery. Craniocervical dissociation results from disruption of the primary osseoligamentous stabilizers between the occiput and C2. Dynamic fluoroscopy can differentiate the subtypes of craniocervical dissociation and help guide treatment. Management of atlas fractures is dictated by transverse alar ligament integrity. Atlantoaxial dislocations are rotated, translated, or distracted and are treated with a rigid cervical orthosis or fusion. Treatment of odontoid fractures is controversial and dictated by fracture characteristics, patient comorbidities, and radiographic findings. 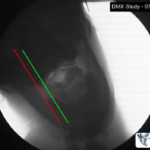 Hangman’s fractures of the axis are rarely treated surgically, but atypical patterns and displaced fractures may cause neurologic injury and should be reduced and fused. Management of injuries to the craniocervical junction remains challenging, but good outcomes can be achieved with a comprehensive plan that consists of accurate and timely diagnosis and stabilization of the craniocervical junction.